Newborns are miraculous- so tiny and precious. Every move, every noise is so sweet. They smell so dang good. You could just stare at them for hours. They are lovely, but they don’t operate on a day/night schedule. Their tiny little stomachs only allow for a few hours worth of milk every time they eat, so they wake you up when they get hangry. All day and night long. Hush Hush Little Baby is founded on that very thing, as our most treasured service is overnight newborn care. Nobody operates well on little sleep, and many parents have found the joy in hiring a professional to care for baby during the nighttime hours. Parenting just got a lot more manageable! Especially for first time parents. Making the transition into parenthood can be overwhelming at times, to say the least. So it can be such an asset to have assistance during the night and with the basics of sleep habits and sleep training. Our goal is to empower parents, not replace them. Our team members include night nannies, newborn care specialists, postpartum doulas and baby nurses. All are trained by The Newborn Care Training Academy and are proud of The International Nanny Association. They are available 24 hours a day! For an overnight shift, they will care for baby during the night by changing, feeding, burping, and getting baby back to sleep. Nursing? No problem! We can bring baby to you for a feed, then take baby out. Not only do we care for babies needs, but we will also implement healthy sleep habits. This can be priceless for families. All babies benefit from consistent and developmentally appropriate routines, no matter what their sleep tendencies are. The pay rate varies based on the level of specialized credentials, but will be between $25-$35 per hour. You can book someone 7 nights a week, or only 1! Our only requirement is that each shift be at least 8 hours long. Typically our Hush Hush Little Baby specialist will arrive around 9-10pm and stay for an 8-12 hour shift. Once they arrive you can go over baby’s day so everyone is on the same page. This is also a great time to use your care specialist as a resource! Newborns can be full of mystery. 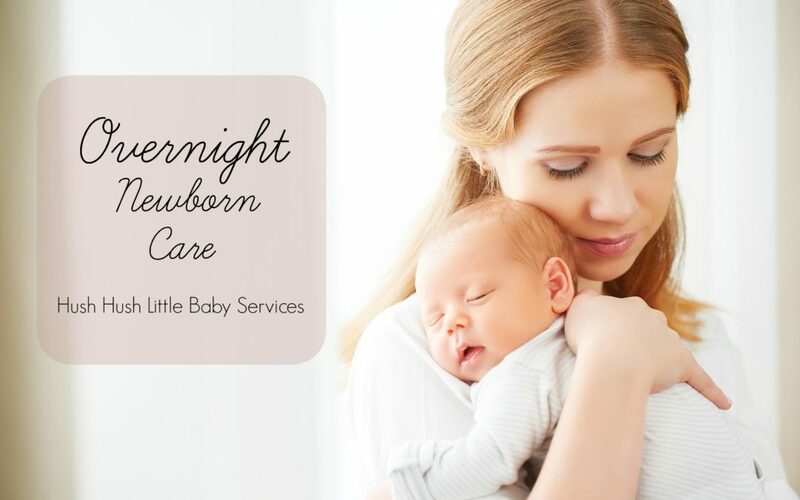 Your overnight newborn care specialist is there to help you with anything you have any questions about. After that, you are free for the night! Take a shower, watch a show, catch up on work, or just simply hit the sheets!